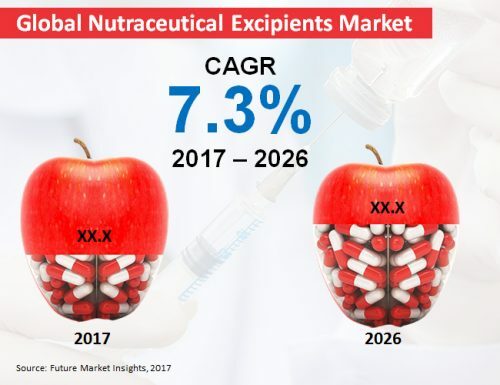 Future Market Insights has announced the addition of the “Nutraceutical Excipients Market: Fillers & Diluents will Remain Preferred Functionality of Nutraceutical Excipients: Global Industry Analysis (2012 - 2016) & Opportunity Assessment (2017 - 2026)" report to their offering. Valley Cottage, United States - March 14, 2019 /MarketersMedia/ — For their nutritional and medicinal advantages, several bioactive compounds and ingredients are being used in the production of medical foods, functional foods and dietary supplements. As health consciousness among consumers increases, the demand for dietary supplements will witness an upsurge. In order to attain a stabilized manufacturing of these products, a range of nutraceutical excipients will be utilized. The key role of nutraceutical excipients in reducing the bioactivity during the production of dietary supplements and functional foods will drive the utilization in pharmaceutical and food industries.